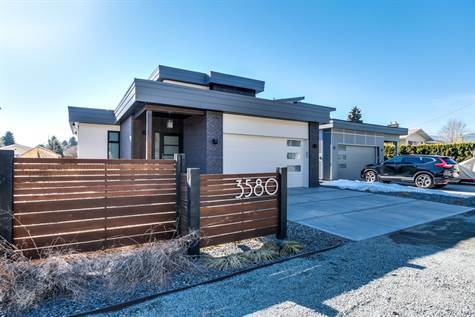 STUNNING CONTEMPORARY LOWER MISSION HOME WITH AN INGROUND POOL!! This almost new home is loaded with high end finishings throughout. The main floor is perfect for entertaining with a custom kitchen, quartz countertops, kitchenaid stainless appliances, a huge island & a beverage centre! The open concept great room has a custom linear fireplace & 4 panel doors leading out to the patio & yard complete with a grass area & 16'x32' INGROUND POOL!! The master bedroom features 12' ceilings, a custom walk in closet, spa like ensuite & another patio with access to the yard. Upstairs has 2 more spacious bedrooms, a bathroom & a den/office. The location is spectacular - steps to Gyro beach and close to close to all other amenities!! No strata fees and no GST!